Asian-language TV station to continue under family ownership. SAN FRANCISCO — TV pioneer and longtime owner of the San Francisco Bay Area television station KTSF Lillian Lincoln Howell died peacefully at her South Bay home on Aug. 31. Born on Feb. 26, 1921, she was 93 years old. Born in Cleveland, Ohio, Howell was the eldest of three children born to industrialist and inventor John C. Lincoln and his wife Helen. Her father, the oldest son of a minister, founded Lincoln Electric in 1895. She attended Pomona College, where she later graduated in 1943. Following graduation, she taught preschool in California, worked as a recreational director in a disabled children’s home in Phoenix, and married Carl Howell, with whom she had her only son, Lincoln. 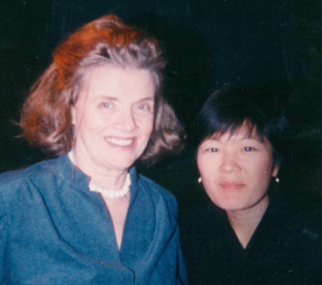 Lillian Lincoln Howell with former KTSF staff member Janice Lim. After the couple separated in 1957, Howell moved to the Bay Area. In the mid-1960s, she learned that the Federal Communications Commission was making a license available for a new commercial television station in the San Francisco market. She applied and was granted the license by the FCC. In 1976, she started KTSF television, whose programming was designed to reflect the diversity of the Bay Area’s Asian American community. Under Howell’s ownership, KTSF became the first television station in the United States to focus on Asian-language and other ethnic programming, offering shows in 12 different languages. The station began transmitting from San Bruno Mountain on Sept. 4, 1976, with Chinese and Japanese programming from overseas and syndicated reruns of U.S. programs. At that time, Asian Americans made up only 5 percent of the Bay Area population. Today, the television market’s Asian American population is more than 23 percent. Over the years, KTSF responded to the changing demographics and began adding live newscasts in Cantonese and Mandarin. Howell believed in giving back through generous charitable donations and as such created the Lillian Lincoln Foundation, which funds documentaries on topics of interest to her: land reform in Taiwan, primary education in Japan, the Swedish system of caring for its elders, micro-lending for women in the third world, and cultural exchange between American and Vietnamese theatrical producers, among others. In addition to her son and daughter-in-law, Howell is survived by her granddaughter, Alisha Howell, and her brother, David Lincoln. Following a private funeral, plans for a public memorial will be forthcoming.